Plastics are found everywhere! From your telephone, fleece jacket, to your Styrofoam cup you’ll find various types of plastic components. Petroleum (oil) and natural gas are the main raw materials needed to make most plastics. By recycling our plastics we are reducing our dependency on non-renewable fossil fuels. What Plastics Can I Recycle in Santa Fe? 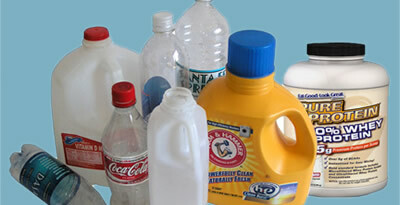 ALL plastic containers regardless of number can be recycled. Please make sure that your containers are rinsed, caps are recycled with bottles and do not crush your containers. *Plastic bags can be recycled in many retail locations in Santa Fe. They accept a wide variety of bags for recycling including: newspaper bags, fruit/veggie bags, frozen plastic bags, sandwich/storage bags and most types of flexible plastic with a #4 printed on it. Note: Businesses may change policies at any time. What does # 1-7 stamp on plastic mean? Plastic is stamped with a recycling symbol and number to help the plastic industry tell the plastic types a part. To learn more, read about the Resin Identification Code.